So, Roccaforte – whose background included meeting management and photography when he started his business with his wife Deb in 1993 – taught himself computer-aided design (CAD) in order to start designing his own meeting sets 10 years ago. Roccaforte began to experiment with substrates for building custom sets, including Dibond® graphic display board by 3A Composites USA. Dibond is a rigid, durable aluminum composite material consisting of two pre-painted sheets of .012-inch aluminum bonded to a solid polyethylene core – a unique composition that makes it approximately one-half the weight of aluminum. In addition to lighter weight than aluminum or wood, Dibond offered Roccaforte the ability to design large meeting display pieces that could be scored and folded to create multi-dimensional effects. “When I saw the Dibond at Meyer Plastics (a Dibond distributor) in Indianapolis, I knew this material had the potential to be formed into the unique set pieces that I envisioned creating for our clients,” said Roccaforte. 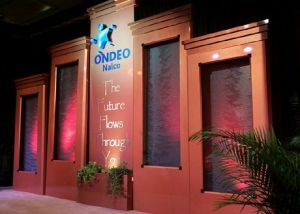 Roccaforte built his first set pieces from Dibond in 2003, including large stage backdrop panels featuring waterfall effects for corporate meeting client Nalco, which provides water purification solutions for industrial clients. The white Dibond panels, which were painted copper, have proved so durable that Roccaforte has been able to re-use them for other meetings, adding custom touches for each client. 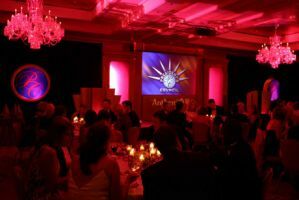 In 2005, the water panels served as stage backdrops for another corporate client’s meeting in Boston, and additional Dibond panels were used to create stylized winged podiums. Later that year, the water panels were installed on either side of a 26-foot tall by 11-foot wide Dibond cross bolted within 2-inch square aluminum framing. 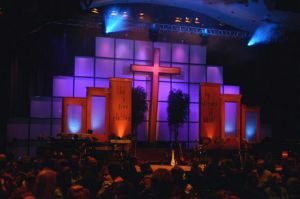 This large cross – which was vertically suspended from the ceiling – served as the focal point of the 20-year celebration of College Park Church in Indianapolis held at the Indianapolis Convention Center. Roccaforte described the cross as “structurally sound” and credits much of that strength to the Dibond graphic display board. “The Dibond aluminum composite panel gave this large hanging cross strength that usually isn’t found in materials so light and thin,” said Roccaforte. The Dibond was scored and bolted to the back of the frame, according to Roccaforte, who scores Dibond to create beveled dimension. In order to conserve shipping space, Roccaforte ships many pieces flat, folding them during installation. The Dibond material is either cut on the back with a CNC router using a 45-degree bit or cut by hand then hand-folded, according to Adam Walsh, president, ISF Sign Specialists in Indianapolis, which has fabricated Dibond set pieces for Roccaforte. Dibond set pieces then are spray painted with automotive paint. Roccaforte sees no end in sight to his ability to reuse these Dibond set pieces.